Elco Motor Yachts LLC wants to bring its hybrid electric/diesel propulsion system to the marine industry. The prototype, installed on a Beneteau Swift Trawler 34, is pictured here. The boat is in the water at IBEX in Tampa, Fla.
TAMPA, Fla. — Alternative power systems have been one of the leading innovations in the marine industry in the last few years, with engines being powered by electricity, propane and even natural gas. As hybrid propulsion packages, they’re often teamed with diesel engines that run cleaner, quieter and with better performance. The new hybrid electric/diesel inboard propulsion system uses a 20-hp Elco electric motor and a 425-hp Cummins diesel inboard. The system was installed on a Beneteau Swift Trawler 34 and displayed at IBEX’s new in-water testing area outside the Tampa Convention Center. “It’s an elegant, clean propulsion solution and many people in the industry are speaking very highly of it and are anxious for it to come on the market. This right here is the prototype,” Elco senior project manager of customer service Neil Satterly told me as he showed me the various components as he stood in the engine compartment in the saloon of the trawler. The single-shaft, parallel system couples the Cummins 6.7-liter diesel to the Elco engine. The boat can reach a top speed of 20 knots under diesel power and can cruise at 5 to 6 knots under electric-only power. A 12-unit AGM battery bank powers the electric engine, which can be operated for as long as two to three hours before it needs charging. The batteries weigh a total of 1,500 pounds and were placed strategically in the boat to maintain stability and performance, Satterly said. The boat already made an appearance at a special press event in Annapolis in early September, Beneteau marketing director Maryline O’Shea said. The boat also will be at the Oct. 30-Nov. 3 Fort Lauderdale International Boat Show. I had a chance to drive the boat under both electric and diesel power. As I cruised along under electric power at 5 knots, the only mechanical sound I heard was the Elco motor’s engine belt turning. And of course there were no fumes. To shift from one engine to another, you must shut off the motor that is running, press a control button on the helm and start the other motor. It takes only a few seconds. 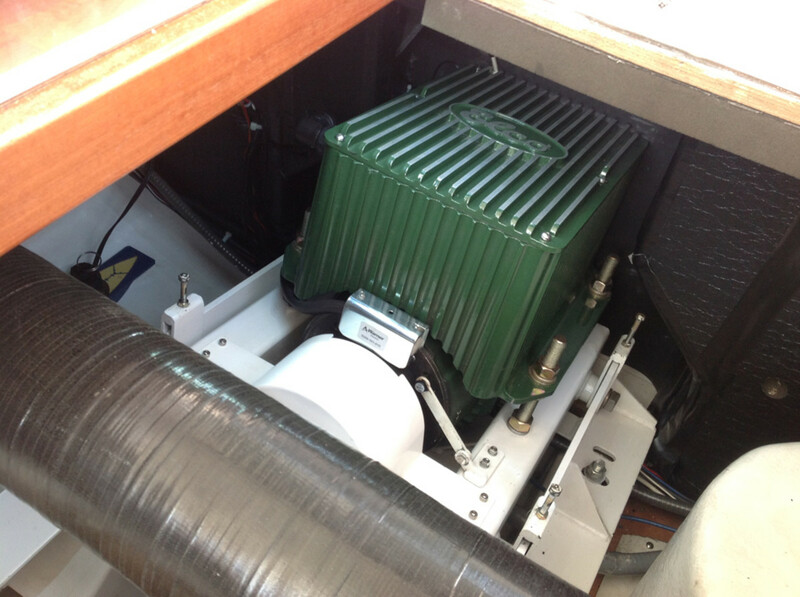 This hybrid power package is attractive to boaters because it allows them to not only cruise in low-speed areas under electric power, it also provides secondary backup propulsion, Norris added.